URBANA, Ill. – Twelve-foot metal poles with long outstretched arms dot a Midwestern soybean field to monitor an invisible array of light emitted by crops. This light can reveal the plants’ photosynthetic performance throughout the growing season, according to newly published research by the University of Illinois. The Illinois team led by Guofang Miao, a postdoctoral researcher in NRES and the lead author of the paper, reports on the first continuous field season to use sun-induced fluorescence (SIF) data to determine how soybeans respond to fluctuating light levels and environmental stresses. Photosynthesis is the process in which plants convert light energy into sugars and other carbohydrates that eventually become our food or biofuel. However, one to two percent of the plant’s absorbed light energy is emitted as fluorescent light. And that emitted fluorescent light is proportional to the rate of photosynthesis. Researchers capture this process using hyperspectral sensors to detect fluctuations in photosynthesis over the growing season. They designed this continuous study to better understand the relationship between absorbed light, emitted fluorescent light, and the rate of photosynthesis. “We want to find out whether this proportional relationship is consistent across various ecosystems, especially between crops and wild ecosystems such as forests and savannas,” said Miao. “We are also testing the applicability of this technology for crop phenotyping to link key traits with their underlying genes,” said co-author Katherine Meacham, a postdoctoral researcher at the IGB. “SIF technology can help us transform phenotyping from a manual endeavor requiring large teams of researchers and expensive equipment to an efficient, automated process,” said co-author Caitlin Moore, also a postdoctoral researcher at the IGB. 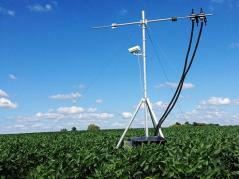 A network of SIF sensors has been deployed across the U.S. to evaluate croplands and other natural ecosystems. Guan’s lab has launched two other long-term SIF systems in Nebraska to compare rainfed and irrigated fields in corn-soybean rotations. “By applying this technology to different regions, we can ensure the efficacy of this tool in countless growing conditions for a myriad of plants,” said Xi Yang, an assistant professor at the University of Virginia, who designed this study’s SIF monitoring system. The paper, “Sun-induced chlorophyll fluorescence, photosynthesis, and light use efficiency of a soybean field from seasonally continuous measurements,” is published in the Journal of Geophysical Research – Biogeosciences, available online (DOI: 10.1002/2017JG004180) or by request. Co-authors also include Joseph A. Berry, Evan H. DeLucia, Jin Wu, Yaping Cai, Bin Peng, Hyungsuk Kimm, and Michael D. Masters. This work was supported by the NASA New Investigator Award, the Institute for Sustainability, Energy, and Environment (iSEE), a NASA Interdisciplinary Science Award and the TERRA-MEPP (Mobile Energy-Crop Phenotyping Platform) research project that is funded by the Advanced Research Projects Agency-Energy (ARPA-E). TERRA-MEPP (Mobile Energy-Crop Phenotyping Platform) is a research project that is developing a low-cost phenotyping robot to identify top-performing crops. TERRA-MEPP is led by the University of Illinois in partnership with Cornell University and SignetronInc. and is supported by the Advanced Research Projects Agency-Energy (ARPA-E).